At most industry trade shows, the vendors are in the booth, and potential customers circulate outside it. 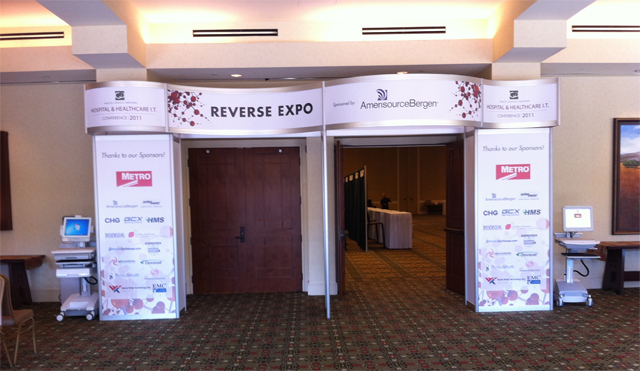 At a “reverse vendor” fair, it’s just the opposite: the vendors go to the customers who are seated at tables. Cybernet participated in such an event on September 28th-30th in Scottsdale, Arizona, sponsored by Health Connect Partners. During the 2-day event, National Sales Manager Tim Dalke and Account Representative Marcus Bednar placed the Cybernet iOne-MP171 and CyberMed all-in-one medical computers on medical carts, wheeling them around to the 105 potential customers seated at the tables. These products really did speak for themselves, and customers were able to experience how the Cybernet all-in-one PCs would perform on a medical cart. All the other participating vendors merely carried laptops around with slide presentations on them, so Cybernet stood out in the crowd by bringing actual products. Cybernet was also the only all-in-one PC vendor at the event. Tim and Marcus were able to present to all of the customers at the event, which turned out to be an excellent opportunity to meet with decision-makers. Along with the other networking opportunities in the evening, this reverse vendor format proved to be a more productive way to acquire feedback and make valuable connections in the industry.